Just two weeks ago I had this interesting experience of opening space for 1,100 (yes, the number swelled) under 4 hours. You probably remember the massive exchange in OSList on how to convene under these conditions as we burned the line talking about the merit of this assignment. The extent of our discussion was remarkable for it showed the depth of wisdom and passion attached to the practice with ideas flying from one side of the globe to the other. It started with an invitation to a two-day symposium on performance management system in government service. And because it’s a symposium there were 6 speakers lined up including a dozen others for concurrent sessions. Day 1 had a couple of plenary and concurrent sessions. Open Space was slated in the morning of Day 2 followed by a formal symposium integration and closure in the afternoon. This was the first time HR people in government are called together, and there was a good mix of people from national agencies, government corporations, state universities and local government units in attendance. The open space session focused on making performance management system (PMS) in public service truly essential, responsive and life giving. Sitting through Day 1 presentations and forums made me realize that the audience have compelling stories to tell in addition to having contending views on how to move PMS in their agency. This prompted me to check my own motivation as I worked with government in the past and I know that PMS has always been a thorny issue in the service. I need to bring respect to everyone involved and there’s no sense adding my own ideas and arrogance to the issue. · Space was tight to include provision of an open space in the middle, but the hotel staff did an incredible job of assembling 5 layers of chairs in concentric circle. With this arrangement a thousand chairs almost reached the wall but then again that’s fine as there was ample space for people to move in the center. To facilitate movement an open aisle was provided from four points of the room so what we actually had was an open circle. · Opening was limited to an hour with 15-minute sponsorship and a walkthrough of the theme and the OST process. The whole spiel gave me time to completely/slowly walk the circle to establish some degree of proximity with the participants. The rest of the hour was spent getting people to queue and publicly announce their topics. · Convenors used placards (illustration board stapled on three-foot bamboo stick) instead of papers to publish their topics. There was no marketplace because the market was mobile. It was messy, disorderly and fun when convenors started to go around the room for membership, while the rest decide which topic to join. The decision to use placards was brought about by hotel’s policy not to stick anything on the wall, and this policy actually worked to everyone’s advantage. · It helped to talk about chaos openly and early on. There’s no way I can manage a thousand in four hours; and the only other thing left was expect chaos, accept it, and work it to my advantage. At the same time I remained calm and secure despite the seeming disarray inside the room especially when people start standing up and moving into groups. It’s essential to coach the sponsor to expect it. The analogy I used to convince them was that of a wedding event, one can think things through and organize it to death but then again things don’t usually turn out as planned. I also told the participants to expect chaos, learn to live with the mess and love it. · When all the topics were declared (about a hundred), I realize it did not make sense sticking to the original plan of having two one-hour session, despite the color coded placards and instructions for groups to have two separate time frames. With placards on hand, people immediately self organized. Not even those sticky numbers posted (yes, this was the only concession we got from the hotel) made sense at this point. Respecting that tendency, I decided not to call for two sessions but instead do a two-hour session on the topics generated. This two hour event gave convenors ample time not only to convene their group and discuss the topic but also time to review and enrich the report. · Wonderful suggestion never to let go of the microphone especially during the queuing for topics and the closing of circle when a drove wanted to speak. We apportioned an hour for closing the circle, with about 20 people sharing their thoughts on the process and how they plan to move forward with PMS in their agency. · What worked for me in closing the circle was having someone to anchor it and in this case it was the Chair of the Civil Service Commission. This was very strategic as one can’t get any higher than this guy. Commitments were made on the results of the OS discussion including the commitment to hold an annual gathering of HR people in public service. 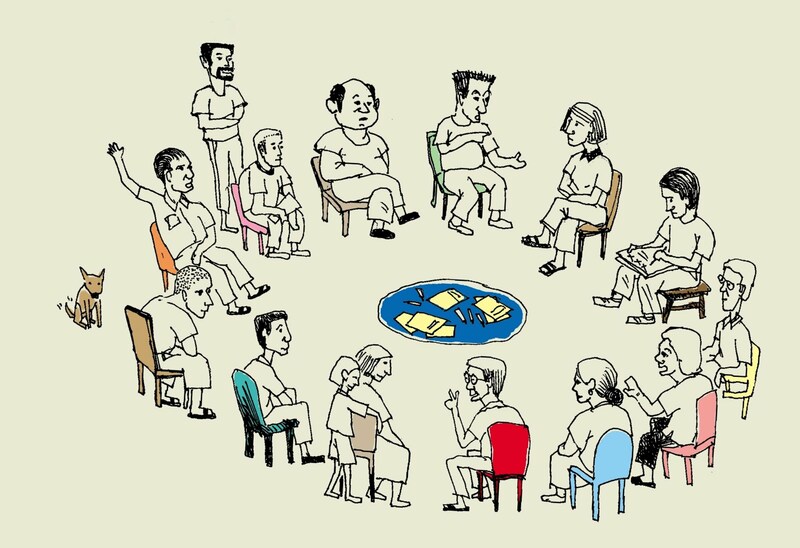 · I worked with one other friend in convening the circle. Having one person to do the walk is fine but it’s important to have someone to help hold the space with me, someone to ground me and to help make sense of the pulse of those in the circle which can easily be missed when one is caught up with things. · I remember Harrison saying that opening spaces is a dance and we can dance beautifully yet we should not be caught in it (I added some words here, not sure if he agrees). It’s this balancing act that keeps me grounded and calm but also allowed me to gently take rein of things when necessary to secure the space, and it worked especially in opening and closing of the space. In the end, OST became an act of accepting whatever comes and letting go whatever goes. · I learn to love the mess and expect that nothing can be completely accounted for. I talk about it with the organizers, cue people who are in the circle and most importantly I embrace it like a mother embraces a child and just let it be without losing myself to it. · I learn to connect...I am passionate about this assignment as I worked with government for 14 years before joining my present job. There was deep connection between my need to serve and the intention of this gathering, and this was instructive in the way I prepared myself for the assignment. I drew strength from my love of government service, that I did not worry myself senseless unlike my previous OS engagements. I eased up and just refused to get caught in the usual pre-work worries. Don’t get me wrong pre-work is important and I’m glad I had a group of young women backing me on the details. But at the personal level, this engagement was unique as I dig deep and spend more time settling down. I also had a good night rest before opening the circle, so unlike the past. And there was a conscious attempt to stop talking the night before, not only outside but also inside. I practiced noble silence, ending the talk from the mouth and the mind. This is graceful silence and a very powerful one, it’s the silence that heals and nourishes, same energy I brought to the circle the next day. · I learn to hack my way through and think on my feet. The ways of OST never fail to surprise me, it served me on what I know would work yet there’s no one way. I learn that there are many possible ways of moving forward, and it is by challenging and provoking what I already know that helps. What is universal and unchanging, what stays are the principles and the law, in whatever arrangements or configuration these are the things that stick. The rest is as experimental as catching the wave. · I learn to stay humble and step back from a prescribed program that’s already agreed upon but at the same time fearless despite what others say because in the end it's also about that one solitary person in the middle of the circle. It’s important to be open to the flow and to feel one’s way through the crowd, just as we do in real life. For better appreciation of this experience, I’ve uploaded some photos in my Facebook account.